Max & Frida All Natural Frozen Dessert is the perfect treat to cool and keep your four legged best friend happy and healthy! Made only with premium, pure and wholesome human grade ingredients and lots of love! This treat is good for humans, too! Especially for vegetarians. 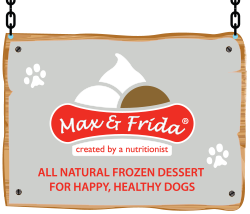 The idea of creating Max & Frida All Natural Frozen Dessert was inspired by our own dogs. Our ice cream company is a privately owned family business that has been around since 1965. We are a big dog loving family who is really passionate about our four legged family members. We eat a lot of ice cream every day and night but, unfortunately, there was no frozen treat available to share with them. As good dog parents though, we couldn’t bear to watch them beg for ice cream. We knew that dairy and sugar are not good for them. That’s how we decided to make a dog-friendly frozen dessert that our furry friends could enjoy all year round! We consulted with our good friend Maria, a great nutritionist and a dog lover herself, to help us create this nutritious and healthful frozen treat. After two years of a long research & development, taste tasting and approval by our own picky four legged gourmets, we came up with a delicious recipe that we know your best friend will love! Then we decided to name it after two of our family dogs whom we love so much. And that’s how Max & Frida All Natural Frozen Dessert was born in 2014! Now we know that we can give our dogs a frozen treat that is really good for their health and we can eat our ice cream without feeling guilty that they can’t have their own. To create the finest, all natural premium frozen dessert for dogs, using only the purest, most wholesome human grade ingredients and lots of love! 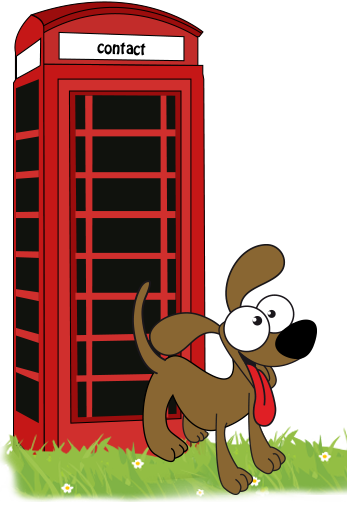 To serve our four legged friends locally and internationally, offering the ultimate indulgence! 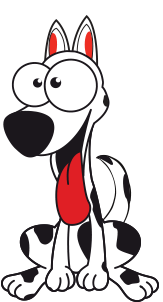 As a dog loving family, we have been committed to creating the finest, all natural frozen dessert for dogs, using only the purest, most wholesome human grade ingredients and lots of love! We add nothing to our premium frozen treat to interfere with purity and perfection....no sugar, no preservatives, no colourings, no artificial ingredients, no artificial flavourings. Our treat is dairy free, salt free, naturally high in antioxidants, vitamins & minerals, enhanced with Omega 3, enriched with fibres and sweetened with pure bee honey. 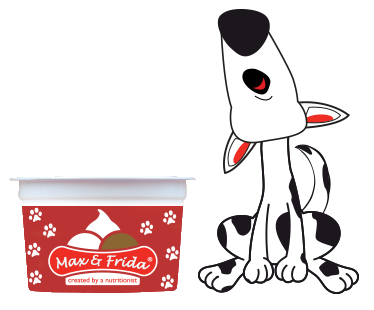 Max & Frida All Natural Frozen Dessert is the perfect reward for training, good behaviour or as a refreshing treat. One cup (small breeds) or two cups (medium & large breeds) per day will keep your four legged best friend cool, happy and healthy! This treat is good for humans, too! Especially for vegetarians. Ice Cream is defined as a frozen food made from a mixture of dairy products, such as milk, cream and nonfat milk, combined with sugar and flavourings, such as fruits, nuts and chocolate chips. 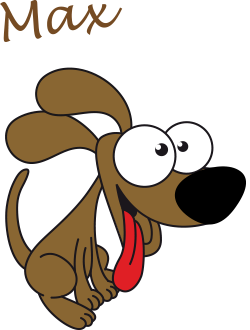 Thus, our treat is called frozen dessert, instead of ice cream, since it doesn’t contain any dairy, chocolate or sugar which are not good for dogs. We manufacture Max & Frida All Natural Frozen Dessert in our ice cream factory, on the Mediterranean Island of Cyprus, along with our “human” ice cream. We currently produce vanilla & honey and honey & coconut flavours. Each flavour is sold separately in four packs of 300ml / 220g, containing cups of 75ml / 55g. Composition: Coconut milk, honey 15%, coconut oil, polydextrose, linseed oil 2%, alcohol free pure vanilla extract 0.8%, mono and diglycerides of fatty acids. Analytical Constituents: Protein 0.3%, crude fibres 3.8%, fat content 12% (of which Omega 3 fatty acids 1%), inorganic matter 0.1%, salt 0.004%, moisture 71.9%. Feeding Instructions: Before serving, allow this product to soften slightly to achieve its full flavour. Always remove the treat from the cup and place it in a bowl. Never leave your four legged best friend unsupervised with a cup. Fresh drinking water should always be available for your dog. Keep frozen below -18°C. Once thawed do not refreeze. Do not feed to puppies under the age of 14 weeks. Composition: Coconut milk 40%, honey 15%, coconut oil 7.6%, polydextrose, linseed oil 2%, mono and diglycerides of fatty acids. 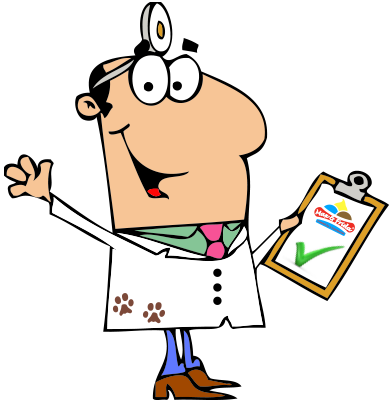 As dog lovers, we take canine health seriously and never compromise on quality! We use only the highest quality, all natural human grade ingredients we can find. We don’t buy anything that we wouldn’t be happy to eat ourselves. All ingredients have been carefully chosen for their health benefits, nutrition and purity. As a result, Max & Frida All Natural Frozen Dessert is very healthful, naturally high in antioxidants, vitamins & minerals, enhanced with Omega 3, enriched with fibres and sweetened with pure bee honey. It’s a super treat which can dramatically improve your dog’s overall health! Honey is considered by veterinarians and animal nutritionists as the best natural sweetener for dogs. It is not only tasty but extremely healthful and nutritious. Honey is rich in vitamins (A, B complex, B1, B2, B5, B6, B9, C, D, E, K, Niacin), and various minerals (calcium, magnesium, potassium, manganese, iron, copper, sulfur etc.). In addition, it contains flavonoids, which are health-enhancing antioxidants. As pet owners, we always look for natural ingredients that may improve our dogs’ health. One ingredient that has been shown to be especially beneficial is coconut. This fruit contains good fatty acids called Medium Chain Triglycerides (MCTs) which regulate and balance insulin and thyroid levels. The main component (more than 40%) of MCTs is lauric acid, followed by capric acid, caprylic acid, myristic acid and palmitic. The lauric acid has anti-bacterial, anti-viral, and anti-fungal properties. Capric and caprylic acids have similar properties and are best known for their anti-fungal effects. Additionally, coconut contains albumin, a water-soluble protein which significantly assists in the formation of red blood cells. Linseed oil comes from the seeds of the flax plant. It is an excellent source of Omega 3 and Omega 6 fatty acids. 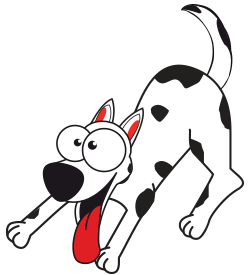 It’s also very rich in the essential vitamin E which works as a powerful antioxidant for dogs. Due to its high content of Omega 3 (50-60%), most veterinarians recommend feeding our dogs linseed oil every day which can do wonders for their overall health. Polydextrose is an excellent source of pure, soluble, highly fermentable fibre with healthful prebiotic benefits for dogs. It is used to provide body and texture in our frozen dessert which is enriched with fibres. The most beneficial action of soluble fibre is to lower LDL (bad) cholesterol and triglyceride levels and to increase HDL (good) cholesterol. Our vanilla & honey frozen dessert is flavoured with the finest quality, pure Madagascar vanilla extract to make it more tasty for dogs. It is noteworthy that our vanilla extract is alcohol free. Keep in mind that alcohol is very dangerous for our four legged friends. Vanilla extract contains essential oils, essential vitamins such as B1, B2, B5, B6, and niacin and minerals such as calcium, potassium, magnesium, manganese, iron and zinc. According to studies it contains strong antioxidant, anti-bacterial, anti-inflammatory, anti-carcinogenic and anti-aging properties. Mono- and diglycerides are added to our frozen dessert as an emulsifier to help prevent the separation of ingredients, achieving a smooth texture. However, we never use mono- and diglycerides produced from animal fats. Ours are derived only from vegetable oil such as sunflower oil or soybean oil. Therefore, they are suitable for vegetarians. Now what are you waiting for? 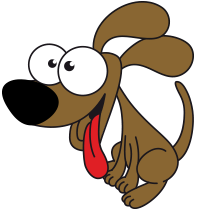 Go get your dog a Max & Frida All Natural Frozen Dessert! Is Max & Frida Frozen Dessert really all natural? YES! 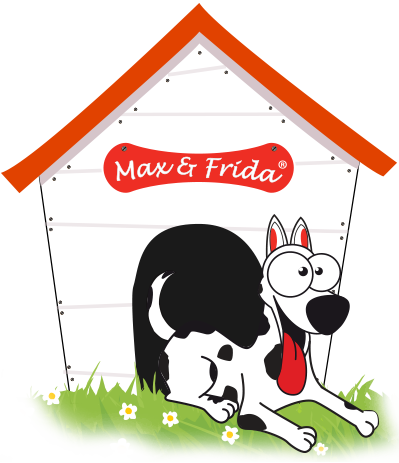 Max & Frida is all natural frozen dessert for dogs, made only with the purest, most wholesome human grade ingredients. We add nothing to our premium frozen treat to interfere with purity and perfection....no sugar, no preservatives, no colourings, no artificial ingredients, no artificial flavourings. For further information, please check the composition of our products and the health benefits of our ingredients. 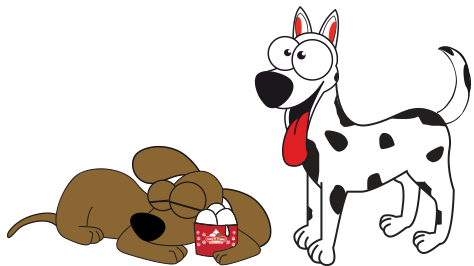 Why should I feed my dog Max & Frida All Natural Frozen Dessert? Our premium frozen dessert is the perfect treat to cool and keep your four legged best friend happy and healthy! It is dairy free, salt free, naturally high in antioxidants, vitamins & minerals, enhanced with Omega 3, enriched with fibres and sweetened with pure bee honey. Besides, Max & Frida All Natural Frozen Dessert is the ultimate reward for training and good behaviour. For further information, please check the analytical constituents of our products and the health benefits of our ingredients. Is it suitable for human consumption? YES! All the ingredients we use are of the highest quality and are of human grade. It was important for us to make something that is good for humans, too! Especially for vegetarians. We don’t buy anything that we wouldn’t be happy to eat ourselves. All ingredients have been carefully chosen for their health benefits, nutrition and purity. Why do you use honey instead of other sweeteners? When should I give my dog a Max & Frida frozen treat? We eat ice cream all year round, your dog should too! Max & Frida All Natural Frozen Dessert is nutritious, healthy, refreshing and entertaining frozen treat dogs can eat on a DAILY BASIS, all year round! One cup (small breeds) or two cups (medium & large breeds) per day will keep your four legged best friend cool, happy and healthy! Why is it called frozen dessert instead of ice cream? It is important to know that some foods which are edible for humans, and even other species of animals, can be very dangerous to dogs. The following common food items should be avoided intentionally or unintentionally. This list is, of course, incomplete because we can not possibly list everything your dog should eat. Items to avoid include: alcohol, apple seeds, avocado, bones, cat food, chocolate, coffee, tea and other caffeine, grapes, raisins, currants, hops, human vitamins, macadamia nuts, milk and other dairy products, moldy or spoiled food, mushrooms, onions, garlic, pits from peaches and plums, raw eggs, raw fish, salt, sugar, tomato leaves, yeast dough, xylitol. We welcome your questions, suggestions and comments. Please contact us. PLEASE READ THIS FIRST: Chances are that the answer to your question / comment appears on this website. If not, just let us know. In this case, we will not use your details in any way other than responding to your email or in ways relating to your request for information, nor will impart your details to any other organization. If you suggest a new flavour, you agree that we may use it free of charge. Please do not forget to include all of your contact details if you would like us to reply. Our company pursues business development opportunities from abroad. We participate in international trade fairs and business meetings abroad and work closely with our export partners to develop their business. Max & Frida All Natural Frozen Dessert is always freshly made according to the orders from abroad. We use a Just-in-Time production system to ensure that our products are always fresh.